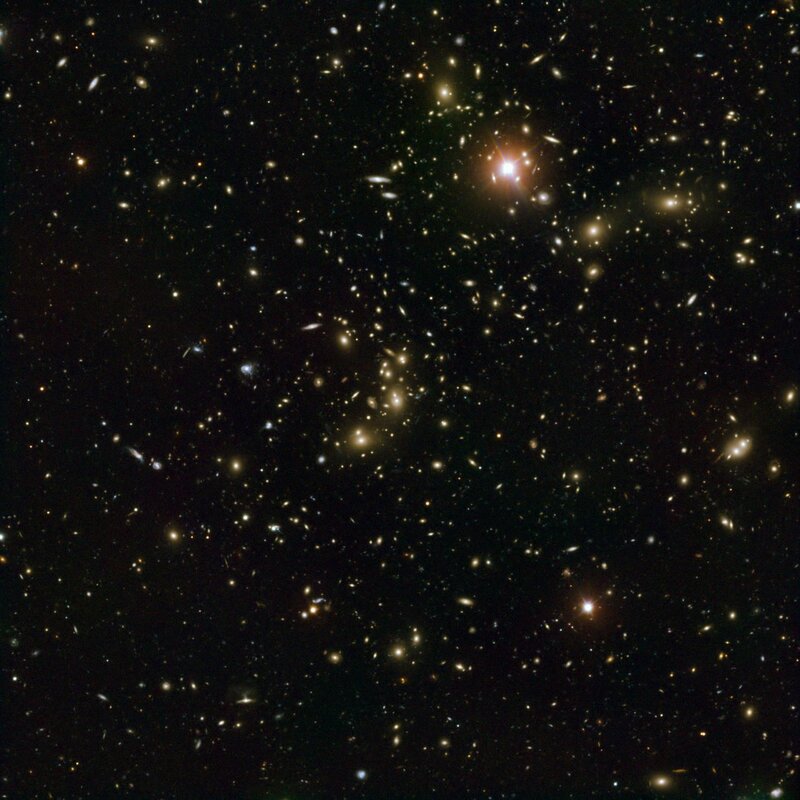 A team of scientists has studied the galaxy cluster Abell 2744, nicknamed Pandora’s Cluster. 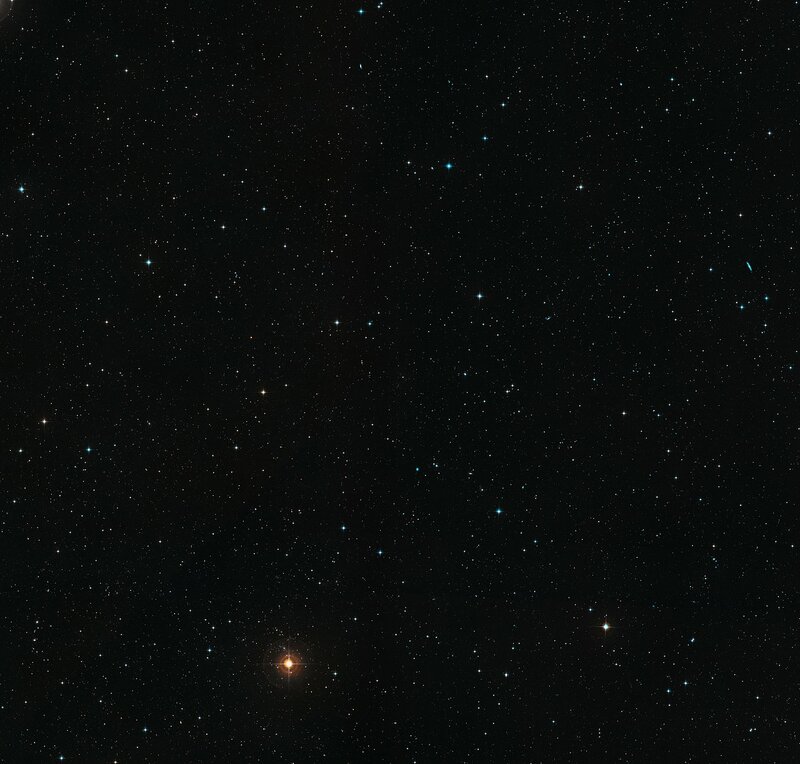 They have pieced together the cluster’s complex and violent history using telescopes in space and on the ground, including ESO’s Very Large Telescope and the Hubble Space Telescope. Abell 2744 seems to be the result of a simultaneous pile-up of at least four separate galaxy clusters and this complex collision has produced strange effects that have never been seen together before. When huge clusters of galaxies crash together, the resulting mess is a treasure trove of information for astronomers. By investigating one of the most complex and unusual colliding clusters in the sky, an international team of astronomers has pieced together the history of a cosmic crash that took place over a period of 350 million years. 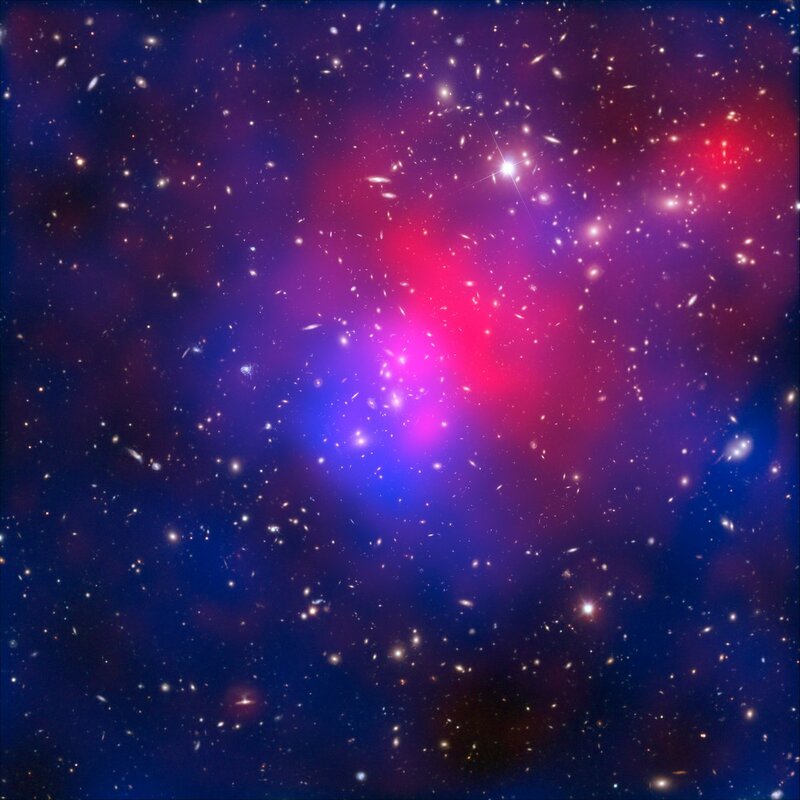 “We nicknamed it Pandora’s Cluster because so many different and strange phenomena were unleashed by the collision. 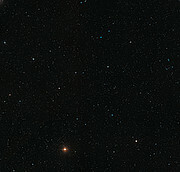 Some of these phenomena had never been seen before,” adds Renato Dupke, another member of the team. 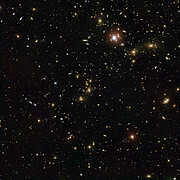 Abell 2744 has now been studied in more detail than ever before by combining data from ESO’s Very Large Telescope (VLT), the Japanese Subaru telescope, the NASA/ESA Hubble Space Telescope, and NASA’s Chandra X-Ray Observatory. 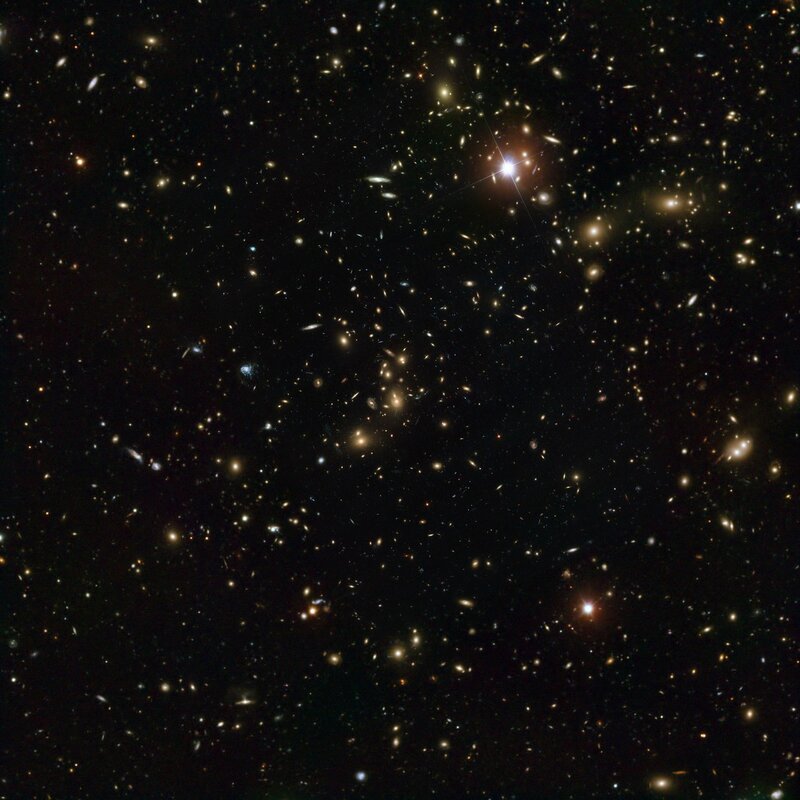 The galaxies in the cluster are clearly visible in the VLT and Hubble images. Although the galaxies are bright they make up less than 5% of the mass there. The rest is gas (around 20%), which is so hot that it shines only in X-rays, and dark matter (around 75%), which is completely invisible. To understand what was going on in the collision the team needed to map the positions of all three types of matter in Abell 2744. Dark matter is particularly elusive as it does not emit, absorb or reflect light (hence its name), but only makes itself apparent through its gravitational attraction. To pinpoint the location of this mysterious substance the team exploited a phenomenon known as gravitational lensing. This is the bending of light rays from distant galaxies as they pass through the gravitational fields present in the cluster. The result is a series of telltale distortions in the images of galaxies in the background of the VLT and Hubble observations. By carefully plotting the way that these images are distorted, it is possible to map quite accurately where the hidden mass — and hence the dark matter — actually lies. By comparison, finding the hot gas in the cluster is simpler as NASA’s Chandra X-ray Observatory can observe it directly. These observations are not just crucial to find out where the gas is, but also to show the angles and speeds at which different components of the cluster came together. When the astronomers looked at the results they found many curious features. “Abell 2744 seems to have formed from four different clusters involved in a series of collisions over a period of some 350 million years. The complicated and uneven distribution of the different types of matter is extremely unusual and fascinating,” says Dan Coe, the other lead author of the study. It seems that the complex collision has separated out some of the hot gas and dark matter so that they now lie apart from each other, and from the visible galaxies. Pandora’s Cluster combines several phenomena that have only ever been seen singly in other systems. 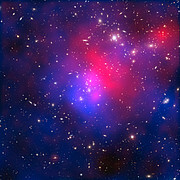 Near the core of the cluster is a “bullet”, where the gas of one cluster collided with that of another to create a shock wave. The dark matter passed through the collision unaffected . 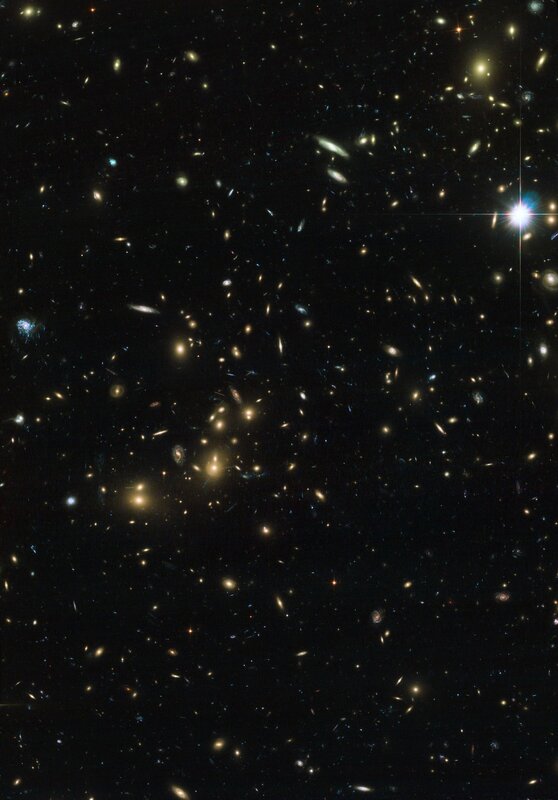 In another part of the cluster there seem to be galaxies and dark matter, but no hot gas. The gas may have been stripped away during the collision, leaving behind no more than a faint trail. Even odder features lie in the outer parts of the cluster. One region contains lots of dark matter, but no luminous galaxies or hot gas. A separate ghostly clump of gas has been ejected, which precedes rather than follows the associated dark matter. This puzzling arrangement may be telling astronomers something about how dark matter behaves and how the various ingredients of the Universe interact with each other. 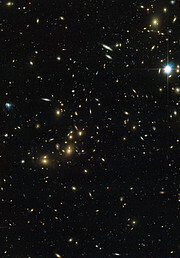 Galaxy clusters are the biggest structures in the cosmos, containing literally trillions of stars. The way they form and develop through repeated collisions has profound implications for our understanding of the Universe. Further studies of the Pandora’s Cluster, the most complex and fascinating merger yet found, are in progress. 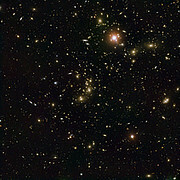 This effect has been seen before in a few galaxy cluster collisions, including the original "Bullet Cluster", 1E 0657-56 . This research is presented in a paper entitled “Creation of cosmic structure in the complex galaxy cluster merger Abell 2744”, to appear in Monthly Notices of the Royal Astronomical Society. The team is composed of J. Merten (Institute for Theoretical Astrophysics, Heidelberg, Germany; INAF-Osservatorio Astronomico di Bologna, Italy), D. Coe (Space Telescope Science Institute, Baltimore, USA), R. Dupke (University of Michigan, USA; Eureka Scientific, USA; National Observatory, Rio de Janeiro, Brazil), R. Massey (University of Edinburgh, Scotland), A. Zitrin (Tel Aviv University, Israel), E.S. Cypriano (University of Sao Paulo, Brazil), N. Okabe (Academia Sinica Institute of Astronomy and Astrophysics, Taiwan), B. Frye (University of San Francisco, USA), F. Braglia (University of British Columbia, Canada), Y. Jimenez-Teja (Instituto de Astrofisica de Andalucia, Granada, Spain), N. Benitez (Instituto de Astrofisica de Andalucia), T. Broadhurst (University of Basque Country, Spain), J. Rhodes (Jet Propulsion Laboratory/Caltech, USA), M. Meneghetti (INAF-Osservatorio Astronomico di Bologna, Italy), L. A. Moustakas (Caltech), L. Sodre Jr. (University of Sao Paulo, Brazil), J. Krick (Spitzer Science Center/IPAC/Caltech, USA) and J. N. Bregman (University of Michigan).